Dr. Portuese will review the surgery plan with the patient the morning of surgery so that both the surgeon and the patient understand one another. At this time, any last minute minor modifications to the surgical plan for the blepharoplasty can be discussed. Patients will also meet with the anesthesiologist from Swedish Medical Center during this preoperative visit the morning of the surgery. The anesthesiologist will also verify that the patient has had nothing to eat or drink since midnight. If routine medications need to be taken (such as blood pressure pills, etc. ), they can be taken with a small sip of water. The anesthesiologist will ask about certain medications, food allergies, latex allergies, or any allergic reactions to anesthesia. 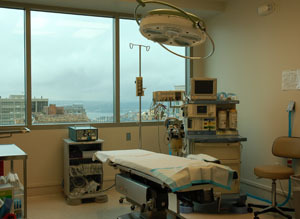 Patients are then brought into the formal operating room where an intravenous line is started, usually in the right hand, and a sedative is given to relax the patient. 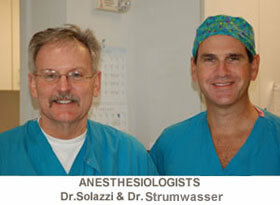 The anesthetic given that puts patients to sleep is called propofol. Once the patient is asleep, a small breathing tube called an LMA (laryngeal mask airway) is inserted on top of the vocal cords and is left in place for the surgery. Patients are breathing on their own under a general anesthesia and there is no recollection of the procedure. Anesthesia is now much safer than it was many years ago due to improvements in technology, the anesthetics, and the monitoring agents used during the surgery. There is also a local anesthetic placed in the eyelids to prevent any bleeding. To ensure the patient’s complete safety, the physician anesthesiologist monitors the patient’s vital functions the entire time the anesthesia is being administered in the Seattle Eyelid and Blepharoplasty Surgery Center. While Dr. Portuese concentrates on making the refinements to the new eyelids, the physician anesthesiologist focuses on the patient’s anesthesia and the equipment monitoring heart, breathing, oxygen, and circulation levels. The monitors that are employed are EKG, which is heart tracing, blood pressure cuff to monitor blood pressure during the procedure, pulse oximeter, which measures oxygen concentration in the blood stream, and a ventilator monitor, which is usually monitoring the patient’s own breathing and respirations. 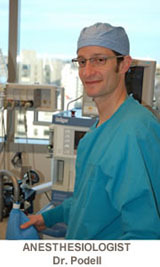 Carbon dioxide and temperature monitors are also used during the surgery to closely monitor the patient’s safety. When the lower eyelid is being addressed, the incision for the fat pad removal is done on the inside from the subconjunctival approach. There are three fat pads on the lowers and a small portion of this fat is removed to get rid of the tired look. Most patients over 50 years of age will need a small pinch of excess lower eyelid skin. If this is the case, this is a conservative 2-3 mm pinch that is taken directly at the subciliary line directly below the eyelashes and is covered by the lower curl of the eyelashes themselves. This incision, when necessary, is closed with Histocryl tissue adhesive that will fall off in 7 – 10 days after surgery. When patients awaken in the recovery room, the eyelids are relatively numb. However, most patients experience some form of mild burning and headache, which is mild in the first few hours in the postoperative recovery phase. Some patients experience a headache after the first few hours of the surgery, but that usually subsides with some mild pain relievers. The recovery at the Seattle Blepharoplasty Center typically takes about an hour to an hour-and-a-half. At that time, the patient can be discharged to home with their caregiver. Very frequently Dr. Portuese will perform a rhinoplasty with eyelids and/or a facelift at the same time eyelids and blepharoplasty is performed. This does not create added complications and these surgeries compliment each other for a full facial rejuvenation.